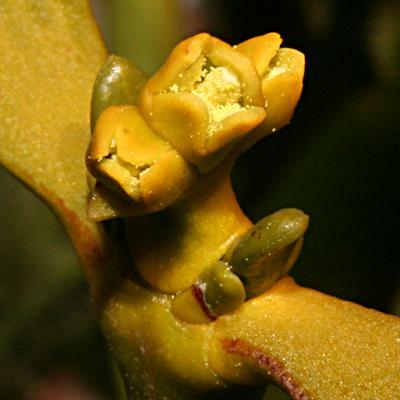 This is my own experience of growing mistletoe from seed, with photos of seedlings developing over the years. 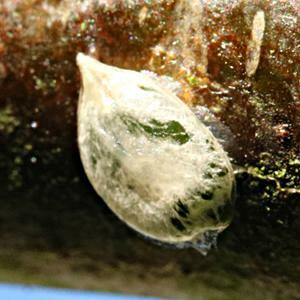 There is lots of information on the web, and it seems nothing 'mysterious' about germinating the seed. Unfortunately, lots of the so-called 'information'* on the web (especially those sites which often come up in searches, but whose content is invariably worthless) is clearly just copied from one site to another with no actual experience of doing it. 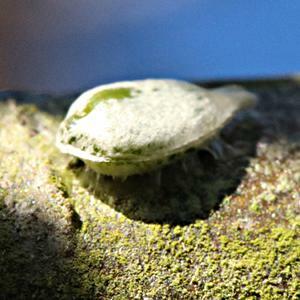 I don't often write about stuff I haven't done myself, so here's the actual story, with real pictures, showing the development of my seedlings on apple, hawthorn, and mountain ash (plus a slightly larger plant I found in the same apple tree). 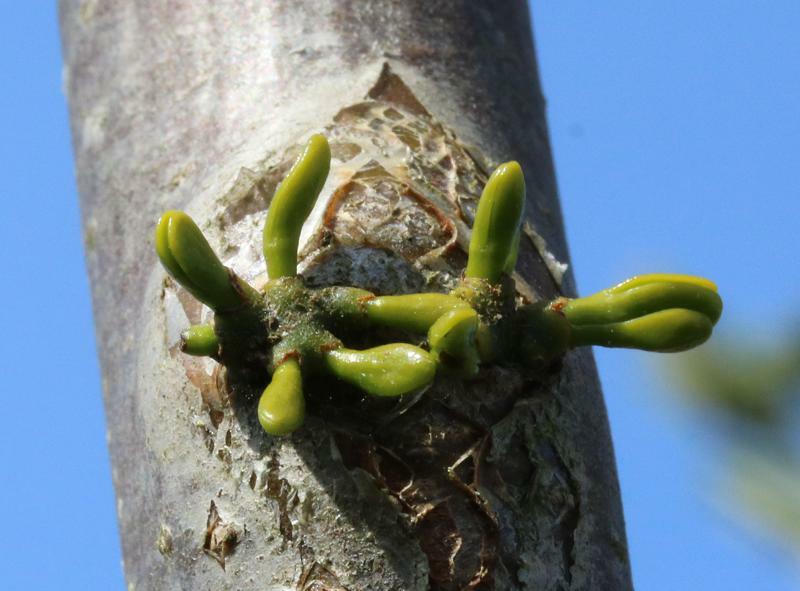 I'd 'sown' mistletoe berries on garden trees somewhat haphazardly in the past (with no results), but here are some pictures of a better effort starting in 2012. 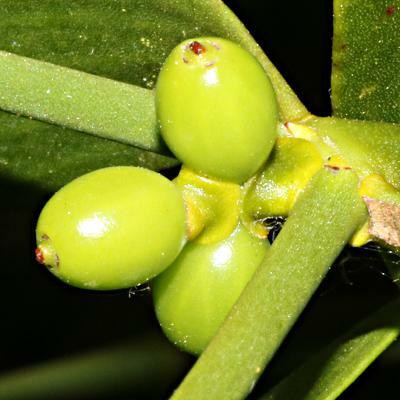 On 18th January 2012, I collected some mistletoe berries from plants growing on Hawthorn (Crataegus monogyna), squeezed out the seeds, and stuck them onto branches of Apple, Hawthorn, and Mountain Ash (or Rowan) in the garden. The seeds are extremely sticky, so no problem at all attaching them - more problems getting the sticky stuff off my fingers! 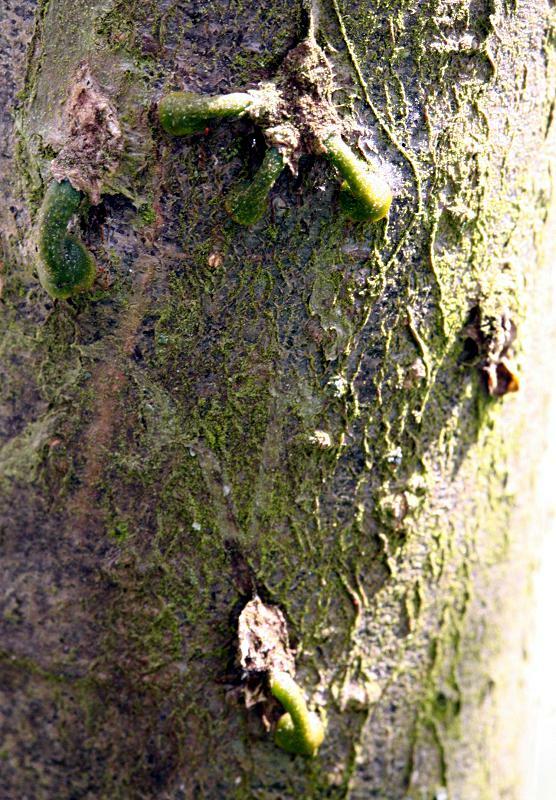 I didn't make cuts or anything in the bark - it seems it isn't needed, and after all, birds wiping their beaks wouldn't bother! 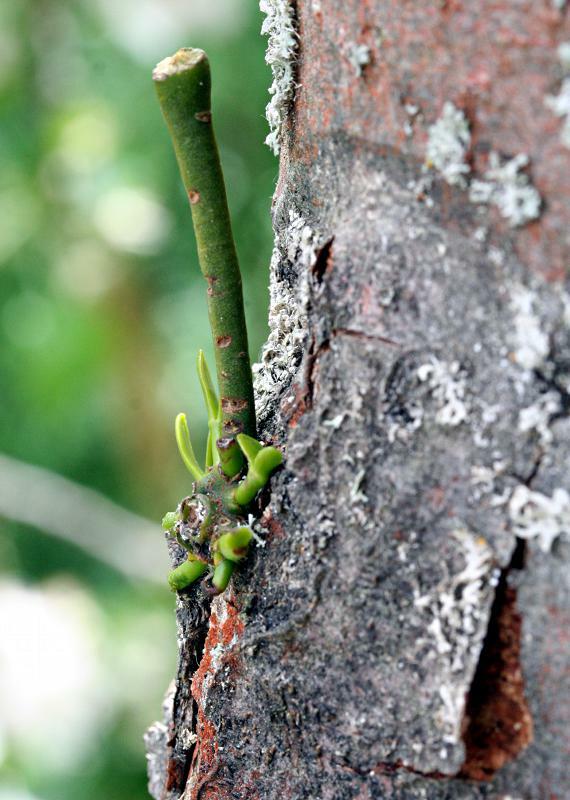 How does the radicle 'know' to grow towards the tree branch? I guess it just grows away from the light. From what I read (and by now have seen for myself), not much, other than germination, happens for a year or two, during which time the seedling might be eaten by birds or animals. Is it perhaps more a case of waiting for the tree to grow around the 'root', rather than the root 'penetrating' the tree? I sowed more mistletoe seeds on the apple tree in 2013. With a cold early part of the year, germination only happened in April this time. 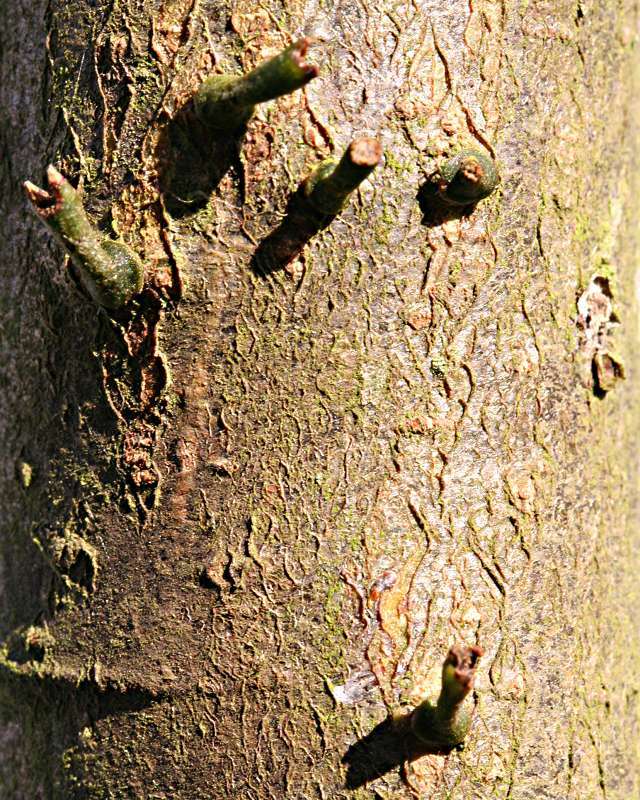 * So-called 'information' from the web: Even the Royal Horticultural Society propagates the myth about needing to put seed under a 'flap' cut in the bark - it isn't needed (indeed some sites claim this would be detrimental). The RHS follows this 'advice' by saying that only 1 in 10 seeds germinate - perhaps if they weren't buried under the bark, nearly all would germinate, like mine did. And a number of sites (no doubt all copied from one original mistake) say to choose a branch about 20cm (8 inches) in diameter - probably rare for branches to ever reach this size, and would be old with thick bark - was this a unit conversion error - perhaps should have said 8cm (though even that would be still rather thick). 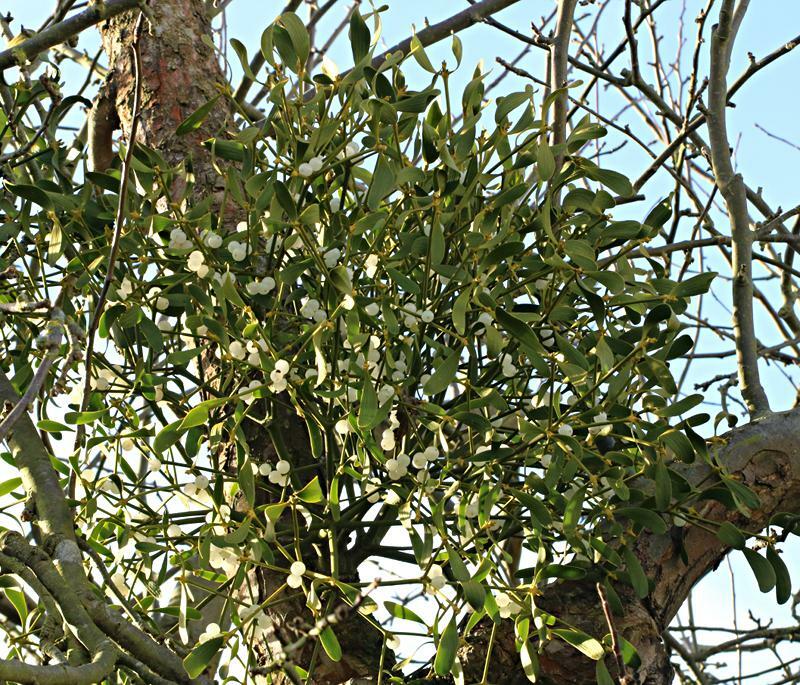 I think 2cm upwards is plenty - remember that by the time the mistletoe matures, years later, the branch will have grown. 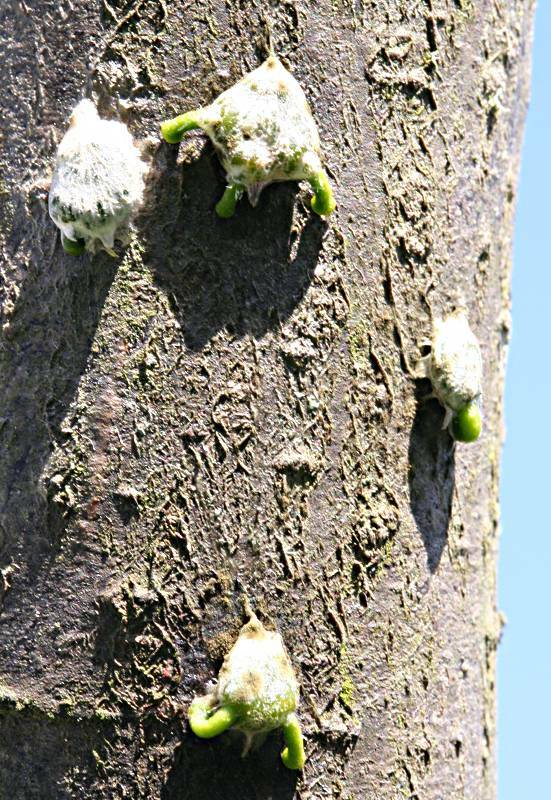 Mistletoe seeds stuck to a branch of an apple tree. I seem to have stuck them on in rather a regular pattern! Around 10 weeks after 'sowing', the seeds are germinating. 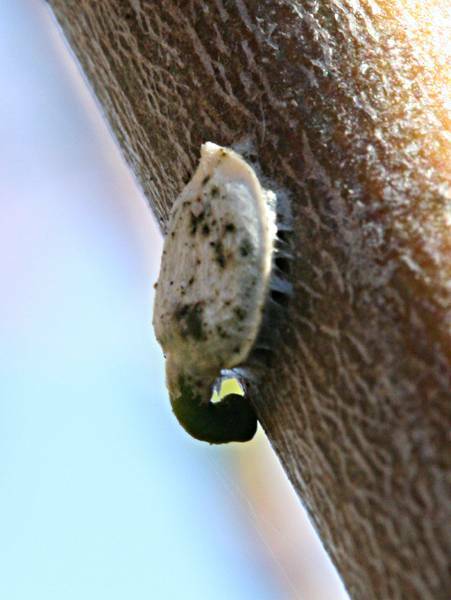 I imagine this depends more on the time of year (light and temperature) than the time from sowing, as the seed stuck to a tree is in a fairly similar situation to when it was still in the berry. 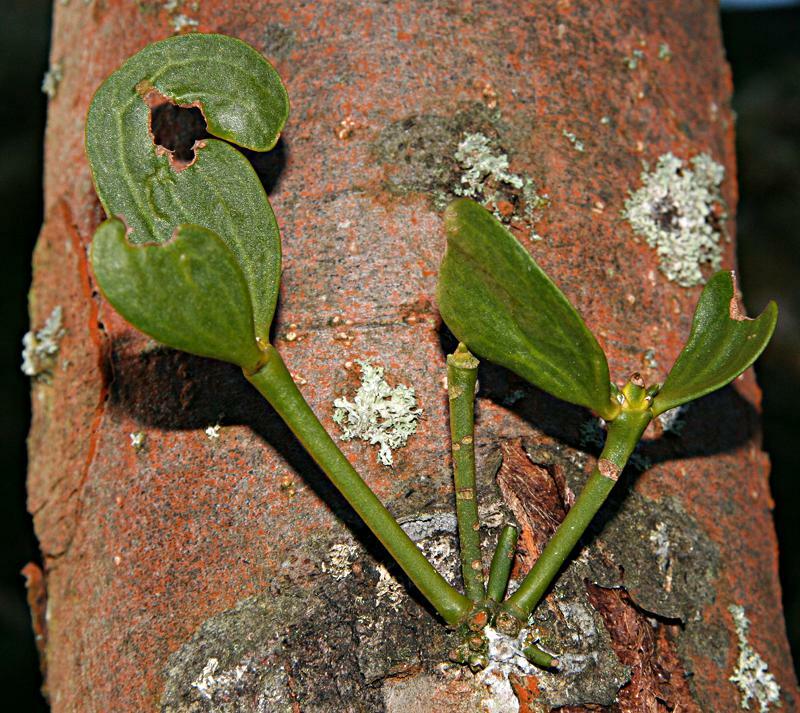 I read that they will germinate anywhere, but obviously only succeed if they happen to be on a host tree. Although there is usually just one embryo in what appears to be a single 'seed', multiple embryos aren't uncommon. I've read about sometimes getting two, and in this photo, I've got a 'three' as well. Another 6 months or so later, we see the same cluster of 4 seeds. The two at the top still have the same number of 'shoots' as before. The one at the bottom now only has one remaining out of the two, and it looks likie the seed at the right is going to fail. 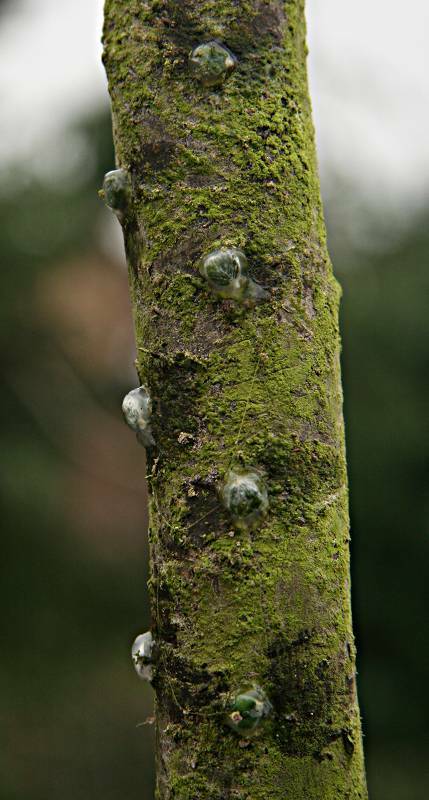 Unlike in the picture on hawthorn below, there isn't any sign yet of the apple tissue 'swelling' around the attachment, but then it's a considerably thicker branch (with tougher bark?) than the hawthorn one. Another 8 months later, so 16 months since 'sowing', we see the same seeds. Not much change (well, it's been winter), and no leaf-growth yet, but the remains of the seeds have further withered away, the 'shoots' have got thicker, and I think that there is some signs of a bulge developing where they attach (better seen when up the tree taking the photos). One of the seeds on hawthorn (below) is developing its first leaves. Another 7 months later, so 23 months since 'sowing', the growth from the same seeds. The old seed-cases have now disappeared, and all 5 shoots (including the 3 at the top which originated from the same 'seed') are now free. Evidently, establishment is a rather slow process - will 2014 (the 3rd year since sowing) bring accelerated growth? I sowed some more seeds on the same apple tree in early 2013, this time trying thinner branches. Another growing season nearly over, and now 32 months since 'sowing', the growth from the same seeds. Still more 'getting established', rather than lots of leafy growth. 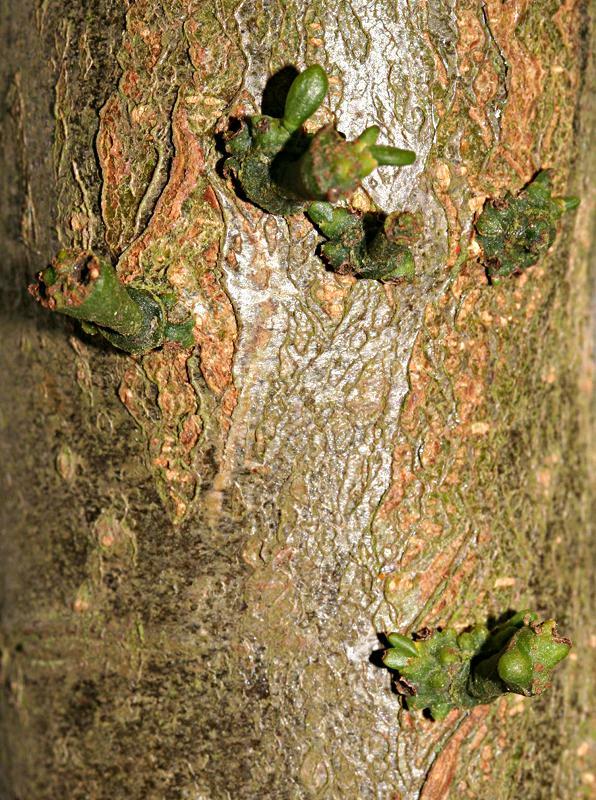 Most of the growth is from the base, near the point of attachment, rather than from the free end of the stem (where the seed originally was). There is another one on this same branch, from seed sown at the same time, which has more leaves, but it hasn't been in my regular series of photographs. In view of the development of the larger plant at the bottom of this page, I'd say next year we'll have plenty proper leaves. Another growing season over, and now 4 years and 1 month since 'sowing', the growth from the same seeds. At last, growth is accelerating. No flowers yet, but another one I sowed at the same time has its first flowers (the male flowers in the photo further down the page). Two growing-seasons since the last photo, and now 5 years and 11 months since 'sowing', the first ripe berries are visible. 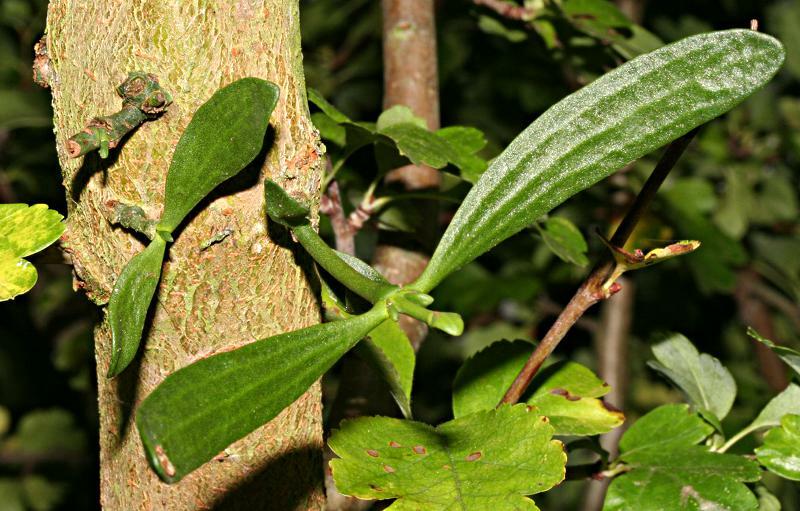 As seen in the photos above, this 'clump' consists of several plants, some male and some female. 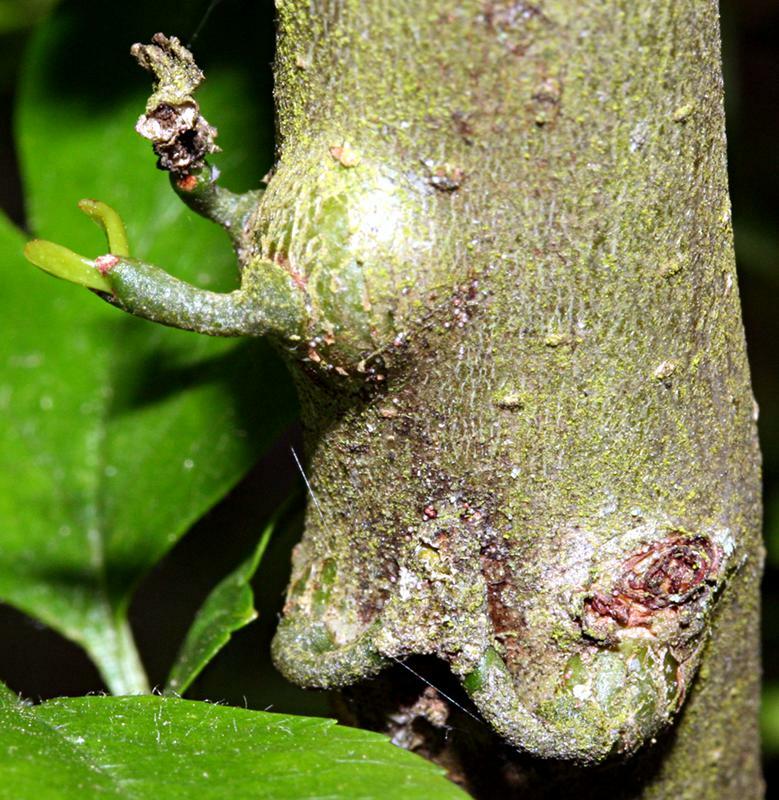 To summarise: The mistletoes on apples, sown in January 2012, opened their first male flowers in March 2016 (photo below), and in March 2017 there were female flowers as well, developing into berries by late 2017. So it was 4 years from sowing to the first male flowers, 5 years for the first female flowers, and nearly 6 years for the first berries to ripen. The pattern of male plants flowering at a younger age (4 years from seed) than female plants (5 years from seed) has been repeated in around 6 which I sowed on apple somewhere else. I stuck some more seeds to a Hawthorn Crataegus laevigata. Some of the seeds I collected were from mistletoe plants growing on hawthorn. Here is one of the seeds germinating on hawthorn. 6 months or so later, here are two of the seeds on the hawthorn again (different to the seed above). 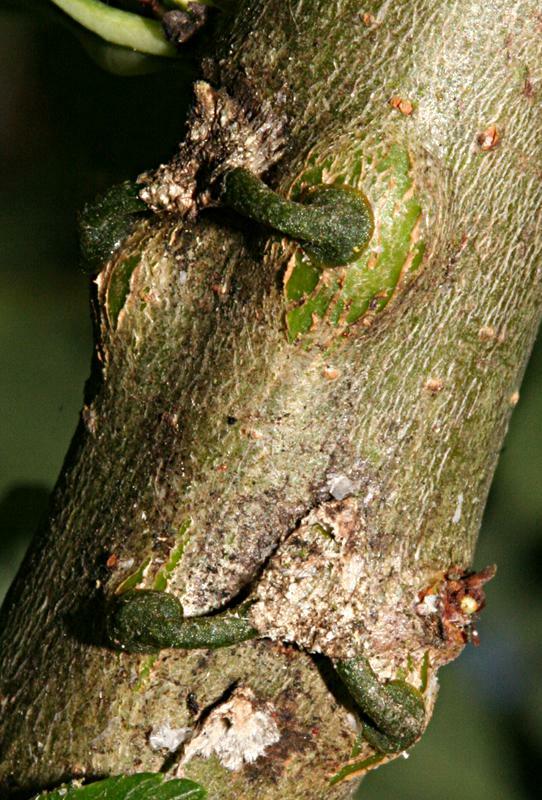 In contrast to the ones on apple above, there is quite a swelling of the host tree around the points of attachment. Another 8 months later, so 16 months since 'sowing', we see the identical seeds to above (photo from slightly different angle). The top two seedlings (both from the same 'seed') have broken free from the old seed remains, and one is developing its first leaves. The two lower ones are still much the same, but then not much happens over the winter period. Another 7 months later, so 23 months since 'sowing', the growth from the same seeds. The scar on the stem at bottom right confirms that it's the same ones. The old seed-cases have now disappeared, and all shoots are now free. The one at which was at top-left, looking a bit battered in the previous picture, has now disappeared. Another growing season nearly over, and now 32 months since 'sowing', the growth from the same seeds. Slow progress continues, with good development from the bottom two, while the upper one has lost what foliage it had (but still looks ready to 'burst forth' again). Another growing season over, and now 4 years and 1 month since 'sowing', the growth from the same seeds. At last, growth is accelerating. These plants don't get much light once the hawthorn comes into leaf. No flowers yet, but another one I sowed on apple at the same time has its first flowers (the male flowers in the photo further down the page). Later news: In March 2017 there were a small number of flowers on the mistletoes on hawthorn, their first flowers at 5 years from sowing, and probably male as no berries developed. 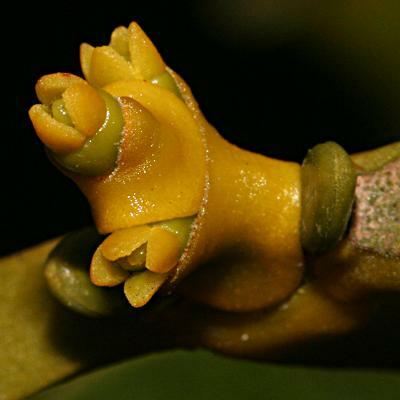 By November 2017, some female flowers could be identified as well. A bit of a surprise here. While up the ladder taking the above photos of my mistletoe seedlings on the apple tree, I was hanging on to the tree branches, and broke a few leaves off something on the back of one of the branches. I wouldn't have thought any more about it, but one leaf landed on another branch, and I thought "that's not apple"! It turned out that there's another mistletoe plant, not one that I sowed in 2012. I don't think I broke much off it - no signs of new wounds on the 'stem' going upwards - I think maybe I broke off two of the small shoots at the bottom, but there are plenty more. At least I know where it is now, and it's easily visible from the ground. I can't remember whether I ever 'sowed' mistletoe seeds haphazardly on this tree in past years, or whether this one has arisen naturally. It's clearly at least a year, and maybe several years, older than the seedlings from 2012, and it's on quite a thick branch. 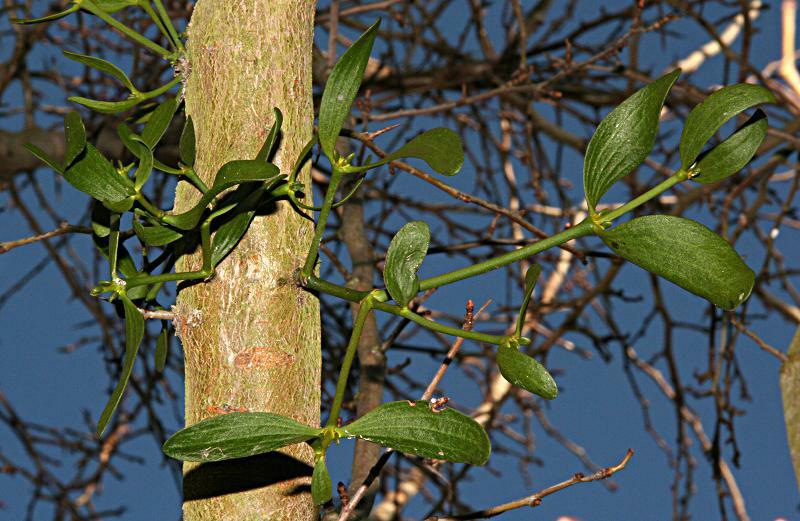 Here is the same mistletoe plant 7 months later. 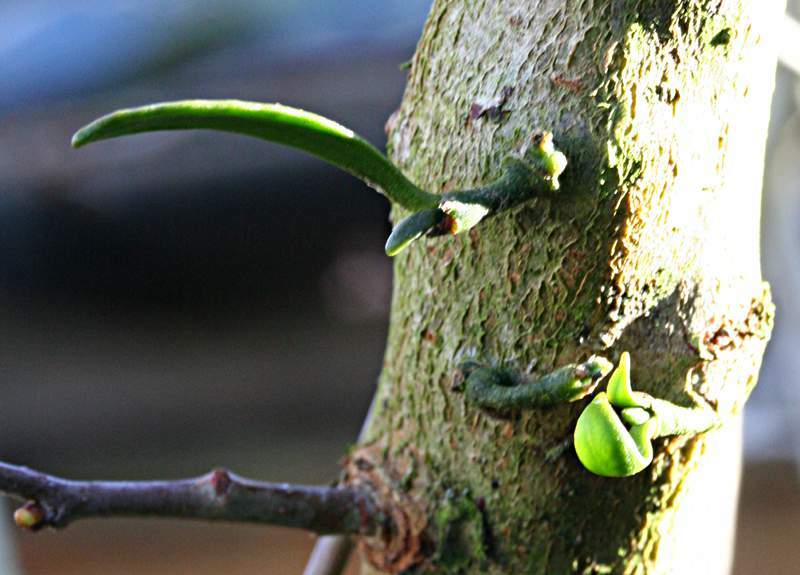 The central leafless stem is the same one as on the previous photo, but the two shoots from the base are already longer than it, so perhaps I can look forward to rapid progress in 2014. 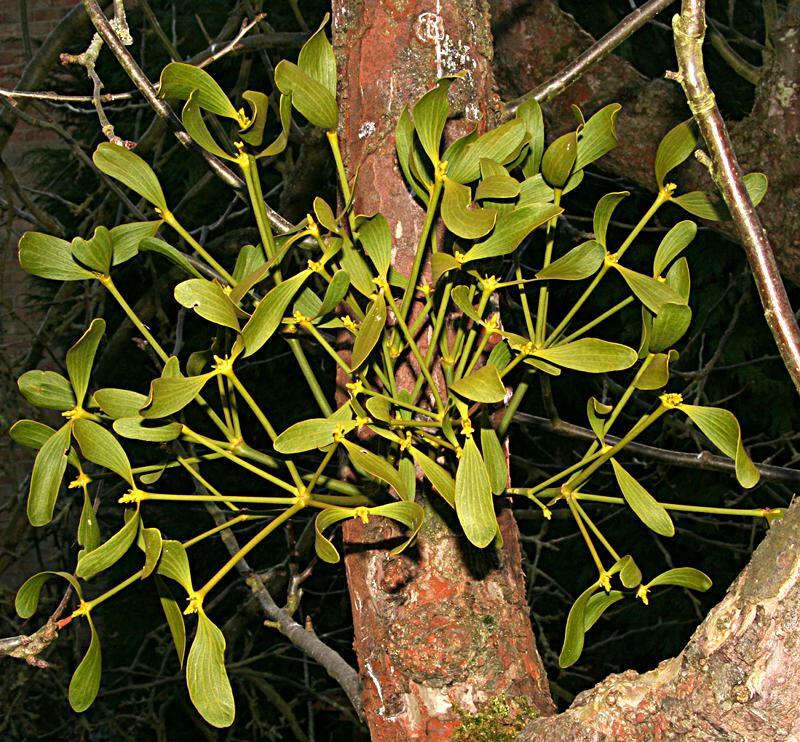 Here is the same mistletoe plant after another 9 months, with another growing season nearly over. As I thought, progress in 2014 has been rapid, with 6 shoots developing from the apex of the right and left stems, and just one from the central stem which was there in the first photo. I would think that this plant will flower in spring 2015, so I'll be able to determine whether it's male or female. 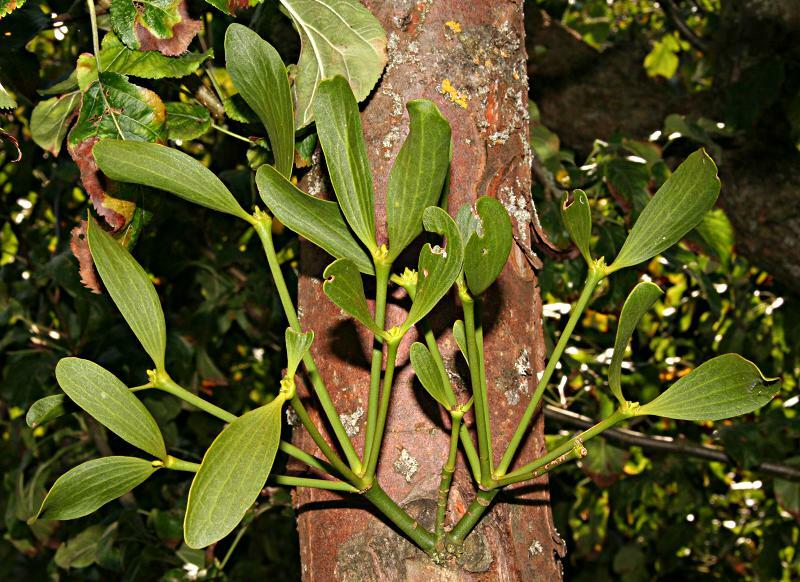 Here is the same mistletoe plant after another 17 months (just one more summer growing season). Each of the shoots shown last time now has a group of 5 or so new shoots at its tip. It didn't flower in 2015, but it's flowering now, and appears to be a female (flowers pictured below). 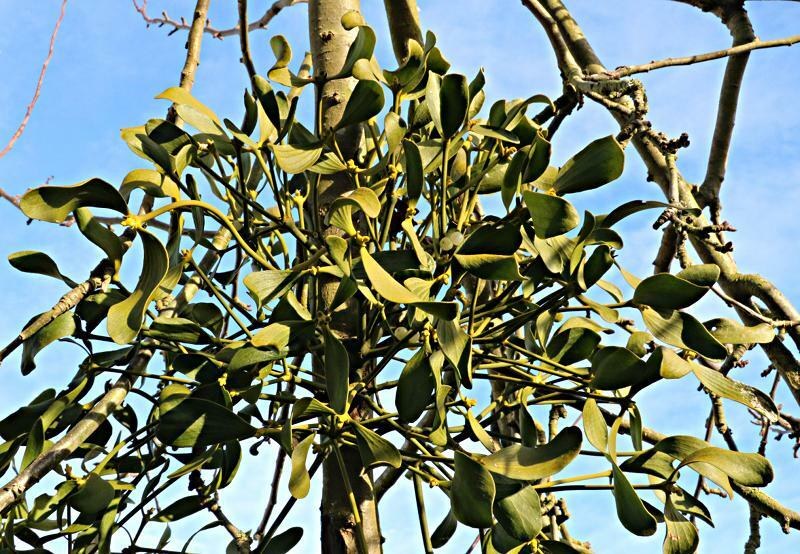 Here is the same mistletoe plant after another 22 months (two more summer growing seasons), and now 4 and a half years (5 growing seasons) since my first photo of it (above). It's now a large clump and, after its first ripe berries a year ago, now has lots of berries. 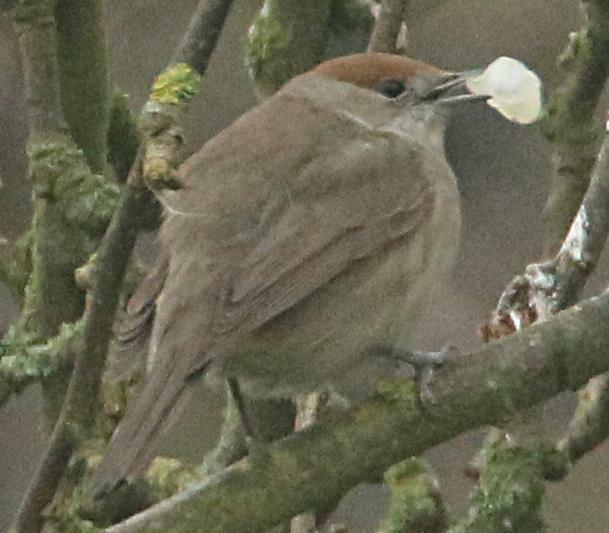 With lots of berries early in 2018, no birds touched them until the end of January, when a single female Blackcap appeared and started to eat them. I saw it several times, over about a week, then it disappeared with a small proportion of the berries still there. As I had read, Blackcaps separate the seed from the berry, and wipe their beaks on branches to remove the sticky seed. 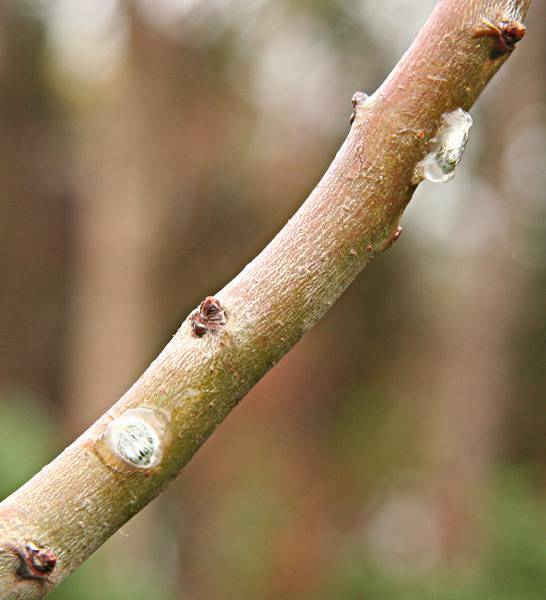 There are now many seeds stuck to branches on the apple tree, the hawthorn, and other plants in the garden. I would expect many of these to grow, just as the ones I sowed myself 6 years ago did, so the apple tree could have a lot of mistletoe in a few years' time. The Blackcap (I assume the same one) appeared again at the beginning of March during a cold spell with snow (photo at right), and set about consuming the remaining berries. Here are photos of 3 seeds sown by the Blackcap on the apple tree. This is after the 'sticky-stuff' has had a week or two to dry. 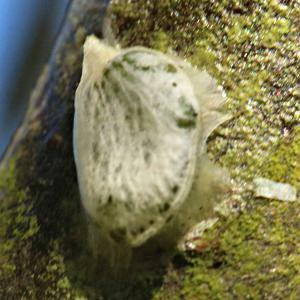 The seeds are on branches around 1cm to 2cm in diameter - the kind of thing that the bird would perch on. At left, a close-up of the female flowers on the above plant. Stigma inside (no pollen), and the flower set in what I assume will become the berry (greenish in colour). At right, male flowers on another plant (from seed I sowed 4 years ago, in 2012). These have visible pollen, are larger, and don't have the berry structure below the flower. The female flowers above appear to have been pollinated, and berries are developing. Later news: The berries matured, and were eaten by birds in January 2017 (probably Blackcaps, as some were seen in the garden). With more flowers in March 2017, lots of berries developed during 2017. I stuck some mistletoe seeds to a Mountain Ash or Rowan (Sorbus aucuparia "Sheerwater Seedling") in January 2012 (the same time as on apple and hawthorn above). I have no photos of their development, as I thought that they had failed to grow. But in March 2017, I spotted this plant (the location on the tree where I put the seeds was still marked). 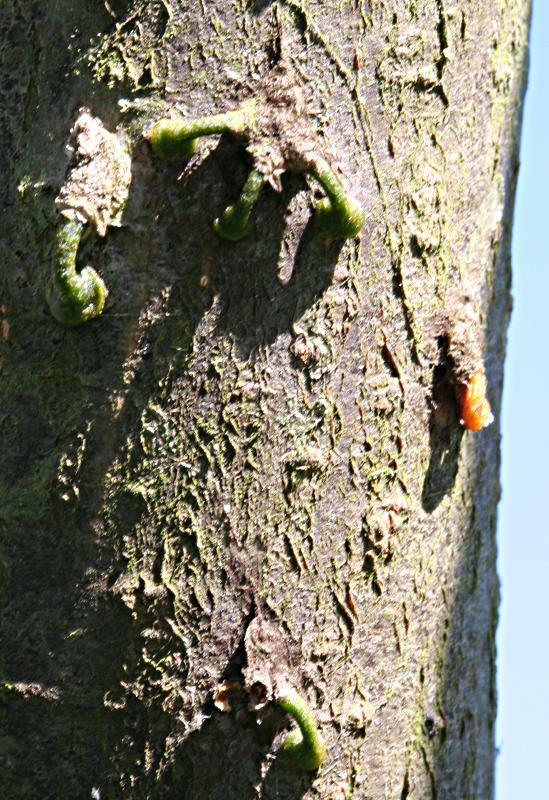 Although it isn't much to show for 5 years of development, it is possible that previous green growth was eaten, as there is quite a large swelling on the branch (now 20mm diameter) where the mistletoe has been developing. I also found small plants of a similar age which I sowed on Rowan somewhere else. They don't seem to grow anywhere near as quickly as those on apple.